(Nanowerk News) A solar cell, made of titania nanotubes and natural dye, may be the answer to making solar electricity production cost-effective, according to a Penn State researcher. "Solar cell technology has not changed very much over time and is still predominantly silicon solar cells," says Dr. Craig Grimes, professor of electrical engineering and materials science and engineering. "It takes a great deal of energy, 5 gigajoules per square meter, to make silicon solar cells. It can be argued that silicon solar cells never fully recover the energy it takes to make them in the first place." The new focus in solar cells is toward dye sensitive solar cells, which have been made using nanoparticles and a variety of dyes. "Nanoparticle solar cells are the gold standard of this new approach," says Grimes. "However, because of limitations, it appears they have gotten as good as they are going to get." The researchers are instead looking at titania nanotubes to replace the particulate coatings in dye sensitive solar cells and, their initial attempt produced about 3 percent conversion of solar energy to electricity. 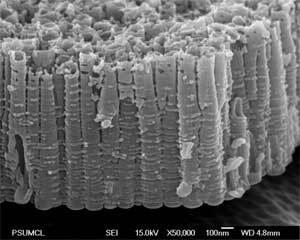 The researcher's inability to grow longer titania nanotubes, constrained the solar conversion rate. The findings are reported in an article in the Feb. 8, 2006 issue of Nano Letters, titled "Use of Highly-Ordered TiO2 Nanotube Arrays in Dye-Sensitized Solar Cells". "I think we can reach a 15 percent conversion rate with these cells, and other researchers do as well," says Grimes. "That is 15 percent with a relatively easy fabrication system that is commercially viable." Conventional solar cells are made from blocks of slowly made silicon boules that are sliced into wafers. Grimes and his team use an easier approach. They coat a piece of glass with a fluorine-doped tin oxide and then sputter on a layer of titanium. The researchers can currently lay down a 500-nanometer thick titanium layer. They then anodize the layer by placing it in an acidic bath with a mild electric current and titanium dioxide nanotube arrays grow to about 360 nanometers. The tubes are then heated in oxygen so that they crystalize. The process turns the opaque coating of titanium into a transparent coating of nanotubes. This nanotube array is then coated in a commercially available dye. The dye-coated nanotubes make up the negative electrode and a positive electrode seals the cell which contains an iodized electrolyte. When sun shines through the glass, the energy falls on the dye molecules and an electron is freed. If this electron and others make their way out of the tube to the negative electrode, a current flows. Many electrons do not and are recombined, but the tube structure of the titanium dioxide allows an order of magnitude more electrons to make it to the electrode than with particulate coatings. "There is still a great deal of optimization of the design that needs to be done," says Grimes. "Now, with the help of the Pennsylvania Energy Development Authority, we will have equipment to make high quality titanium coatings that are thicker. If we get about 3 percent conversion with 360 nanometers, what we could get with 4 microns is an exciting question we soon hope to answer." The thickness of the titanium layer constrains the height of the nanotubes. With thicker initial coatings, longer tubes would produce more electrons that do not recombine, producing more electricity. Other aspects of the titania nanotube dye sensitive solar cells that need to be optimized include the thickness of the cells. Currently, spacers separate the two layers and provide internal support. These spacers are 25 microns thick. If the spacers could be made as sturdy, but shorter, there would be less of a distance for the electrons to travel and more electrons will make it across the electrodes.